Recycled Stereo Plus: Acoustic Zen Maestro: I need a pair of these! Acoustic Zen Maestro: I need a pair of these! Acoustic Zen Maestro: These sound unbelievable! The Maestro features a 2" horn loaded ribbon tweeter, a set of 5" and 8" midrange drivers, and two 10" woofers in a transmission line design. This speaker is capable of filling the largest rooms and effortlessly handling significant dynamics in music and movies. The Maestro has a time-aligned D'Appolito MTM arrangement to provide life-like sound. The midwoofer-tweeter-midwoofer loudspeaker configuration (called MTM, for short) was created by Joseph D'Appolito as a way of correcting the inherent lobe tilting of a typical mid-tweeter (MT) configuration, at the crossover frequency, unless time-aligned. 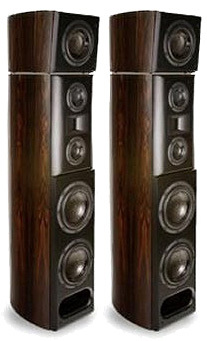 In the MTM arrangement the loudspeaker uses three drivers: Two mid-range (or mid-woofer/woofer) for the low frequencies and a tweeter for the higher frequencies, with the tweeter being placed between the mid-range drivers (as shown in the second image below). D'Appolito initially configured his design using a 3rd order (18 dB/oct or 60 dB/dec) crossover, D'Appolito has since amended this original recommendation in favor of 4th order topology. However, this does not impart any significant effect on the MTM design's unique characteristics. The 8" driver handles the lower mid-range. The ribbon tweeter provides for extremely accurate, low-distortion sound with incredible clarity and detail. The curved cabinet reduces enclosure resonance and the baffle geometry reduces diffraction artifacts.